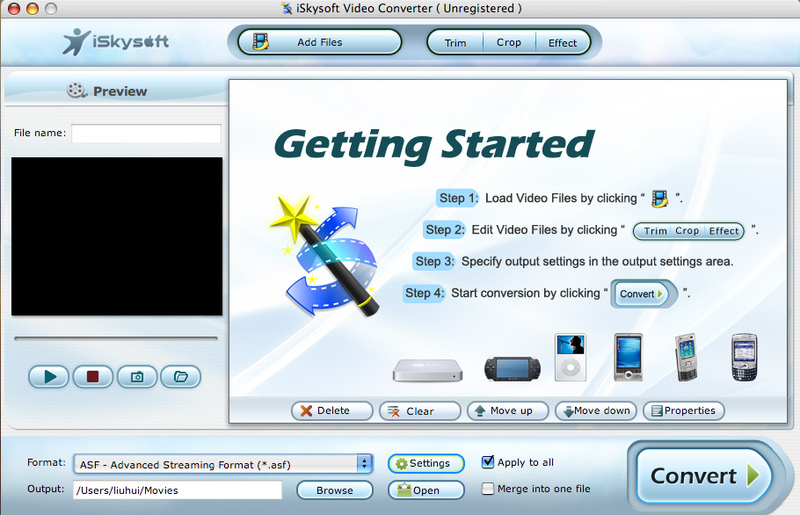 iSkysoft Video Converter for Mac is developed to convert all popular video files from one format to another format and convert video to audio for Mac OS X users. It supports video formats such as MPEG1, MPEG2, MP4, 3GP, 3G2, AVI, Mpeg TS/TP (for HD Video). It can also convert video to audio formats including WAV, OGG, 3GP, Mp3 and M4A. ...... Convert any video format on Mac OS X with iskysoft Video Converter for Mac! 1.A powerful Mac video converter software to convert all video formats including FLV, MKV, MOD, WMV, ASF, MPEG1, MPEG2, MP4, 3GP, 3G2, MOV, AVI, M2TS, MPEG TS/TP (for HD Video), M4V, etc. 2.It can also convert video to audio formats including MP3, MP2, OGG, 3GP, and M4A. 4.Convert videos for iPod touch, iPod classic, iPod nano, iPhone, Apple TV, PSP, PS3, Youtube (web), Creative Zen, iRiver PMP, Archos, various video mobile phones and many other digital video and audio players. 5.Merge all added files and output one file. 6.Set movie video brightness, contrast, saturation, and choose to apply special video effects to your video files. 7.Crop your video to remove black sides. 8.You can trim your video files to only convert a part of a video file. Qweas is providing links to iSkysoft Christmas OFFER Mac Video Converter 1.8.1.2 as a courtesy, and makes no representations regarding iSkysoft Christmas OFFER Mac Video Converter or any other applications or any information related thereto. Any questions, complaints or claims regarding this application iSkysoft Christmas OFFER Mac Video Converter 1.8.1.2 must be directed to the appropriate software vendor. You may click the publisher link of iSkysoft Christmas OFFER Mac Video Converter on the top of this page to get more details about the vendor.